Happy Election Day! I love Election Day partly because I just love the feeling I get after I finish voting. It makes me feel so proud to live in this country and for the right we have to vote. The good feeling makes it worth the hassle of going to polling place and waiting in a line, even the three hour wait I had a couple years ago. And the possibly horrible experience waiting for me this year when I bring a toddler and a seven month old along. Still worth it! If you've voted, you probably know what I'm talking about. 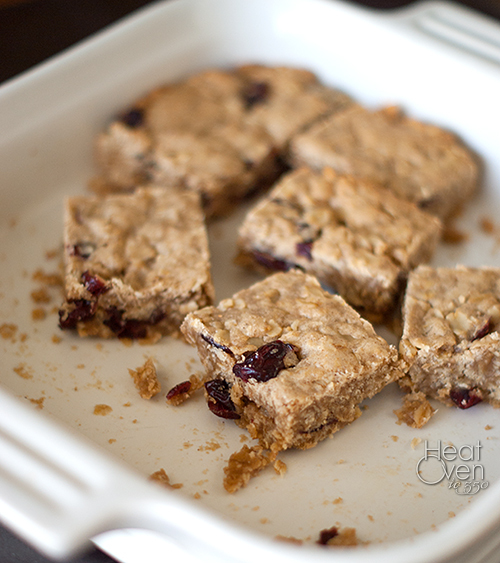 The good feeling from voting is usually reward enough, but in case you want to reward yourself further, here are some cranberry oatmeal bars you should make, like, today. Or as soon as possible. They are super easy, super tasty, and perfect for this time of year. They are sweet and tart and perfectly soft, yet chewy. This is one of only a handful of treats I've made that my husband has eaten repeated servings of. The whole pan disappeared much faster than is healthy for our family but the gluttony certainly tasted good. This is a perfect recipe for a fall potluck or sweet treat on a chilly fall night. Spread batter in prepared pan and bake 25-35 minutes or until a toothpick inserted in the middle comes out clean. 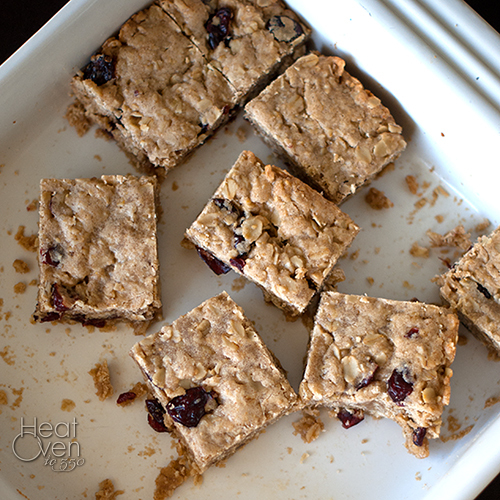 Cool bars in the pan before cutting into squares and serving. yum. These scream fall and I will be making them shortly! You are back! Just caught up with you, the baby, good eats. Glad you figured that out about the tongue tie - I had no idea! Your daughter is absolutely beautiful! Thanks, Biz! You have got to be one of the nicest bloggers I "know". :) Thanks for welcoming me back. I'm still in the process of catching up on my blog reading but I'm excited to see what you've been cooking up while I've been away.